For 3 1/2 years, Norman Weiss would hear in his spirit, “Norm, the doors are open, come on in” when he drove by St. Alphonsus Church in Greenwell Springs on his way to work at the Baton Rouge Airport as a supervisor for the Transportation Security Administration or even to the grocery store. One day Weiss agreed, “All right, God. I’m coming back after work and I’ll go into the church.” When he walked into St. Alphonsus, Olga Johnson, director of religious education, met him. When he told her he wanted to learn more about the Catholic faith, she informed him RCIA classes were starting that Thursday and he said, “I’ll be there.” He and his wife, Judy, took the classes together. Norman is experienced in looking after the safety of people and making sure they get to their destination. He was a “Hollywood Marine” stationed in San Diego, California in the Air Wing as an aviation ordinance chief before becoming a gunnery sergeant. He worked in the transportation business and began his career with TSA in the aftermath of the Sept. 11, 2001 terrorist attacks. But he and Judy talked about how the Holy Spirit is coordinating their journey into the Catholic Church, which will culminate with the couple entering the faith at the Easter Vigil Mass at St. Alphonsus. Norman grew up in the Lutheran Church in St. Louis, Missouri and attended the Lutheran School until he was in the eighth grade. Judy grew up in Cape Girardeau, Missouri. The couple met at Southeast Missouri State in Cape Girardeau. After they married, they lived in San Diego for 33 years. While Judy was growing up, she attended a neighborhood Baptist Church, but stopped attending as she got older. It wasn’t until after she and Norman married that Judy attended church again. Their son, Hunter, was baptized in the Lutheran Church. The Weisses left the Lutheran Church for a while and attended a congregational church before returning. But even then, seeds were planted in the Weiss’ minds about joining the Catholic Church. While Norman was at work one day, Judy flipped through the channels and came across an episode of “The Journey Home” on EWTN. She then watched the program regularly. She bought the Catechism of the Catholic Church and Catholic Bible and also enjoyed reading “The Four Witnesses” by Rod Bennett. Judy shared with Norman her thoughts about the “The Journey Home,” which he sometimes watched, and about what she was learning in her readings. But they did not explicitly talk about joining the Catholic faith. 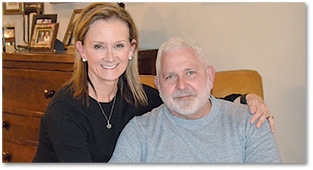 They said Angelle’s parents, Thomas and Lonnie Daggett, who are active members of Our Lady of Mercy Church in Baton Rouge, have been instrumental in their journey. Thomas Daggett is an RCIA instructor at Our Lady of Mercy. One of the Weiss’ favorite traditions is eating breakfast Saturday mornings at Frank’s Restaurant with the Daggetts and other Catholic couples. But the spiritual nourishment of Jesus in the Eucharist is what the Weiss’ look forward to most about joining the church. “I’m looking forward to receiving that first Communion because that’s the reason I wanted to come into the Catholic Church in the first place,” said Judy. Belonging to a large group of Catholics worshipping God through the same Mass liturgy also appeals to the Weisses. “When you’re in Mass you know Catholics around the world are doing the same Mass. That’s the one church I’ve always felt that God wanted us to be,” said Judy.